Halloween is in the air, and here at Fiddlesticks we're stocked up on our very favorite kind of costume: Magical Fantastical Superhero Capes! We've been lucky enough to carry capes from local line Baby Leo Designs right from the beginning of Fiddlesticks history, and they're a constant shop favorite. From dress-up-at-school day to birthday-boy-or-girl attire to making-grocery-shopping-with-dad-more-fun to the best-ever Halloween costume, Baby Leo capes never fail to save the day! And who, you may ask, is the wizard behind the Baby Leo curtain? She recently swooped in for a quick interview with us - read on! Hello! Could you introduce yourself, and Baby Leo Designs? My Name is Mimi Sweeney, owner of Baby Leo Designs.We are a small crafter/manufacturer in San Francisco, specializing in Superhero Capes. Each one of our capes are made-to-order, from cut to finish, by local Artisans, with fibers made from post-consumer plastic bottles. If Baby Leo Designs were a kid, what would its favorite candy be? If Baby Leo Designs were a kid…. his favorite candy would be Gummy Bears. He would be a total goofball, silly, and happy, and most likely to play with his food before he ate it. All three of my boys love, love, love imaginative play. I can only imagine what goes on in their “little skulls,” or, I should say, their giant minds, zestfully recomposing experiences into whatever logical or illogical sequence they envision. Each one of them sees ordinary objects as something else: a spoon as a skyscraper, the couch transforms into a spaceship, or a blankie as a cape. One day I watched in bewilderment as my shy three-year-old, Leo, ran back and forth with his blankie around his neck, planning daring rescues with his imagination soaring… all within the boundaries of our living room walls. 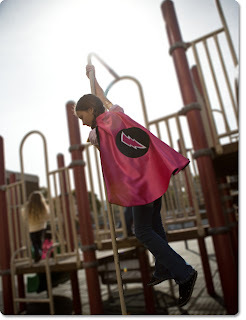 It was magical, and it became apparent that every child needed a cape. The first cape I ever made was not by any means “Super,” but it did have the power to bring an abundance of strength, courage and imagination. 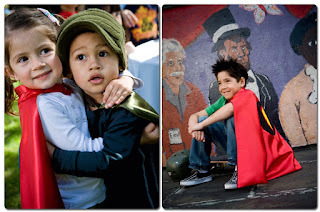 What superpowers can kids expect to acquire when they put on your capes? Each kid possesses his and her own, very unique superpower. This Superpower can only be revealed and realized when the kid uses his and her imagination. IMAGINATION is the vital “Super Power” . Any new ventures in Baby Leo’s near future? I am working with a graphic designer on a small insert to be included with each cape: a superhero coloring book. What childhood Halloween costume are you the most proud of? Six years ago, my third son, Leo, wanted to be a “star”. I sewed a big piece of yellow felt with five points and put him in it. Everyone thought he was a piece of cheese. And finally, what are you dressing up as this year? This year I am going to dress up as Sweet Polly Purebred, and of course my husband is going as Underdog. We hope you'll drop by and check out the beautiful batch of capes Mimi just whipped up for us! Think very scary Mr. Skull and Cross Bones, Zany Turquoise Lightening Bolt, and two oh-so-special, created just for Fiddlesticks designs: Shooting Rainbow Star, and the most Magical Unicorn you've ever seen! All capes come in two sizes (and, psst, adult sized capes are available as well! ).